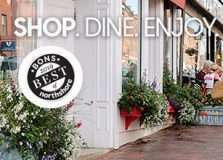 NEWBURYPORT, MASSACHUSETTS (April 2019) – Shop Newburyport (NewburyportShops.com and NewburyportMarinas.com) is pleased to support our shops nominated for the 2019 Best of the North Shore (BONS) Awards, the 14th Annual Northshore magazine Readers’ Choice awards for the best places to dine, mingle, play and shop on the North Shore. Nominations are open until May 1, 2019. Newburyport Development, a New England Development Company, is located in the heart of downtown Newburyport, Massachusetts, where you’ll find historic neighborhoods and cobblestone streets alongside contemporary restaurants, a shopper’s paradise, and modern galleries. As one of Newburyport’s leading property owners and property managers, Newburyport Development owns more than 50 prime retail/office locations and residential units throughout downtown Newburyport, plus Newburyport Marinas, Michael’s Harborside restaurant, Harborside Catering and the Phoenix Room function facility. Newburyport shops include Lively Kids, francesca’s, Talbots, FatFace, M.K. Benatti Jewelers, SOAK & Shoreline and many more. Dining selections feature Michael’s Harborside, The Poynt, Brick & Ash, Oregano Pizzeria and Ristorante and Dos Amigos Burritos, among others. All are part of Newburyport’s vibrant waterside setting, which offers some of New England’s best fishing, boating, dining, and shopping. For more information, visit www.NewburyportDev.com and www.NewburyportShops.com. For over forty years, New England Development has taken a creative, entrepreneurial approach to real estate development and management – delivering and sustaining successful projects across a wide range of property types. These projects transform complex challenges into preferred locations, generate long-term value to communities, afford compelling opportunities for local and national businesses, and offer sought-after experiences to a wide range of consumers. The company is acclaimed for creating some of the country’s most widely-recognized and successful regional centers, as well as multifaceted developments that combine retail, residential, hotel, and office uses. Outlet centers, high-end and street-front retail, airport retail, golf courses, restaurants, and marinas round out New England Development’s robust portfolio. For more information, visit www.NEDevelopment.com.